Pink flowers evoke happiness, love and admiration. That’s just how you feel. And they’ll understand it when this array of roses, lilies, alstroemeria and more arrives. It comes hand-arranged in a clear glass cylinder vase, ready to deliver smiles and grace their décor with lasting beauty. Presented by Bloomnet. 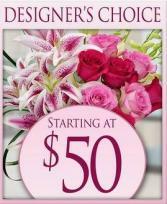 Allow one of our designers to custom make a gorgeous arrangement for your Mother on her special day. We will use only the freshest blooms and can create something of your vision or one of our designers. You may request a specific color scheme or we will simply do a nice bright mix of seasonal flowers. Serve up plenty of Mother’s Day smiles with this two-in-one gift! 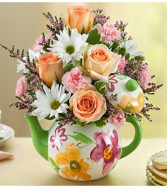 Our lovely arrangement of pastel roses, carnations and white daisies is beautifully hand-designed inside a reusable floral teapot. Arrangement of peach roses, light pink mini carnations, white daisy poms, pink calcynia, pink waxflower and variegated pittosporum. Presented by Bloomnet. 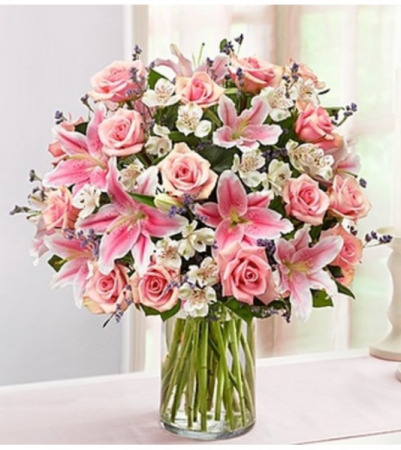 For Mother's Day, or as a warm welcome to Spring or if someone is feeling just a little under the weather — this charismatic arrangement does more than surprise, it captivates. 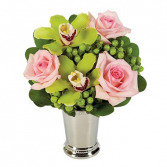 Creating the look are green cymbidium orchids, green hypericum and pink roses in a "mint julep" vase.